Office for iPad has been released (and do we really care ?). Microsoft have finally released a version of Office specifically designed for the iPad. It consists of 3 apps (Word, Powerpoint and Excel) plus the OneNote app that was released a while ago. What are they like? Well -in fairness to Microsoft - they haven't done a bad job. The apps have been designed specifically for the iPad and it shows. They work smoothly - without all the clutter that the desktop versions have ( I know some people will say you can hide all the tools on the desktop version - but I have always found you need some things showing and are stuck with them all). Out of all the apps Word and OneNote are the best. Word has most of the functions you would want but with one major omission ! You can't print. Maybe this will be fixed in the future. OneNote is fairly good. I have been using it for a while. It links nicely with your desktop version (whether windows or Mac - in case you didn't know -there is a desktop version for Mac now). It doesn't do audio and a few other features that are in the desktop version. But for an iPad app - pretty good. Powerpoint was never as good as Keynote on the desktop and that is still the case with the apps. If you really need to view presentations done on a windows machine then it might be handy. But then again Keynote will run Powerpoint presentations as well. Excel is often the default for people who do a lot of spreadsheets and will probably remain so. It appears to have most of the functions people need. I am not an extensive user of spreadsheets and find apples Numbers and Google Sheets fill my needs. For people who want to view Office documents, as they were rendered, on the iPad - then Office is a big win. Also, one aspect I am impressed with - the ability to insert tables. It is one of the reasons I have always come back to Pages for my note taking on the iPad. Very few apps will enable you to insert tables on the iPad. Pages will and now so will Word and OneNote. Will I personally be using Office for iPad in the future ? No I won't. Mainly for the same reason that very few Educational orgaisations will as well. You can download the apps for free (Microsoft boasted that Office had 12 million downloads in the first week) - but you can't use them without an Office subscription at $99 a year. No organisation I know of has moved past Office 2010 or 2013 for this very reason. 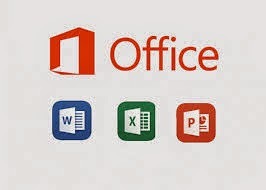 You have been able to edit and save Office files with other apps for a while now - so there are already other things in place if you need them. iWorks is free and actually contains more features then Office. Fraser Speirs did an interesting comparison between the two. I identified 75 word processing features and compared Word, Pages and GDrive on iOS. Pages has 61, Word 57, Google Drive….18.Of 54 high-level spreadsheet features: Excel: 39; Numbers: 42; Google Drive: 23. For people who really need Office and already have a subscription - then they are fairly sound apps and will do a good job. For the rest of us. iWorks is free. Keynote still outshines any other presentation app on the iPad. Pages is still the smoothest word processor on the iPad. Other apps will view and edit Office documents when needed. Then there is also Google Docs.